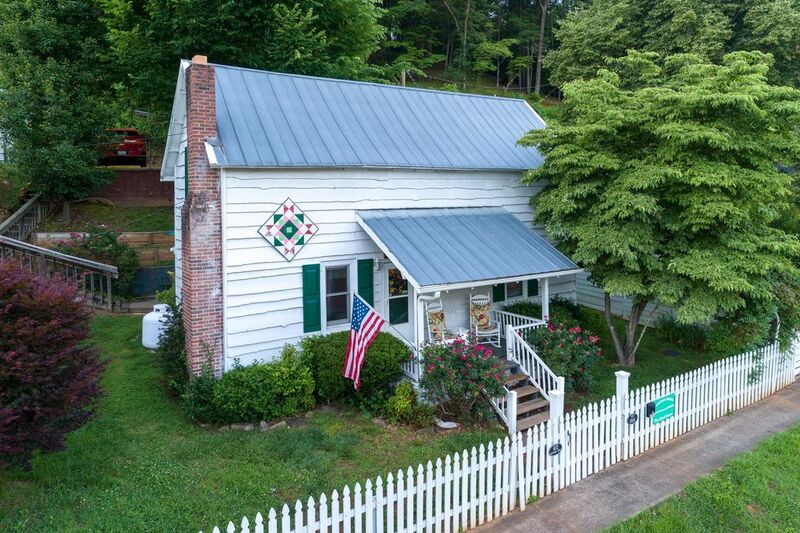 Stay in the Heart of Dillsboro! A cozy two story house located in the center of Dillsboro. You can walk to all the shops, restaurants, the train station, and rafting facility. Enjoy the mountains without having to drive up the side of one. Sit on the front porch and enjoy the town. The house, originally built in 1906, is newly remodeled with a modern kitchen, gas fireplace, and all the comforts of home. Home also features WIFI internet connection. Sit on the deck and enjoy the sunset over the mountains. This is the ideal place to base your WNC vacation, close to all the major towns and attractions. Comfortably sleeps five adults. This cabin is pet friendly and will allow pets. All pets must be declared on the Pet Policies Addendum of our Vacation Rental Agreement. Entire yard is fenced in. There is no pet fee. Access: Easy - Paved to Parking Area. Then Walk Down 20 Steps to Door. Hi, we are the Reeds, Sheldon & Mary Anne. We have a friendly golden retriever named Harley and three beautiful horses. Because our 4 acre Florida home is very private and tucked away in the woods...we wanted our mountain vacation house to be located in town. Dillsboro is the perfect location. There is so much to see and do all within walking distance.Zoom in on the map below to see how the Reed House is centrally located. After taking a motorcycle trip with friends to the Smoky Mountains in the fall of 2006, we fell in love with the quaint little town of Dillsboro, NC. Returning three months later we saw a 'For Sale' sign on an adorable two story 100+ year old house. Close to a year was spent driving 1400 miles round trip to update & renovate our new purchase. It was worth every bead of sweat, every dollar spent, and every mile driven. We love our mountain house and its perfect in town location. Beautiful mountain views off the front porch and back deck. Within walking distance to shops, restaurants, playground, river tubing and train depot. (3) HD TV in living room, master bedroom and in 2nd bedroom. Direct TV on all 3 TV's..
(2) DVD player in living room& 2nd bedroom. Variety of DVD's available. Fenced yard for children and pets,Front porch with 2 rocking chairs provided. Dog loved fenced yard; husband loved closeness of Cherokee; I loved the restaurants! Bed very comfortable (in fact, I'm headed to Costco to get a foam mattress cover for our bed)....well appointed place; good Internet. No complaints (did call in about two pickets blown off the fence during a storm, but the corgi was not in danger of getting out of the fenced area as he's got a little weight to lose!) All in all, delightful vacation. My husband, daughter, dog and I all thoroughly enjoyed this cozy mountain rental. My daughter was especially delighted that it was all decorated for Easter. And my husband and I couldn’t get enough of the rocking chairs on the front porch. We all loved that we could do easily explore the town and find wonderful places to eat and shop within walking distance. It gave me a vacation from cooking too! We look forward to returning sooner rather than later! We enjoyed it very much. The location was perfect for strolling thru the local shops and walking to lunch or dinner. Our dogs (Cavalier Spaniels) enjoyed the yard and lounging near the fireplace at night. They still had the Christmas decorations up which was a lot of fun and made it easy to tell our local friends were we were staying. We would stay there again for sure. We wanted a quiet getaway over New Year's to refresh and recharge. We'd been through Dillsboro twice and had seen the house from the outside. I was thrilled when it was available at a wonderful rate. We were not prepared for just how charming it was! Every square inch of the house was decorated for Christmas. The microwave & fridge had decorations. Even the drapes had been changed out for Christmas drapes! Amazing! The kitchen had by far the nicest equipment we have ever seen in a VRBO and we've been to many. There was a few temperate days and we were able to sit on the front porch and just people watch. Minutes from Cherokee and Gatlinburg isn't too far away either. It felt like home. Highly recommend!! This sweet house was wonderful! We stayed during the last weekend of the luminaries and lights festival and instantly created memories that wil last a lifetime. My daughter, husband and I all took part in setting up and lighting the luminaries in front of the house. The walkability of the house in relation to the town was awesome. If you’re looking to get back to basics and enjoy the simple things in life, this house makes that happen. It truly was magical. Thank you, Mary, for sharing your home with us! This was our second stay at the Reed House, and we loved it! We saw snow in the charming town that was already decorated for Christmas. The house is immaculately clean and comfortable, with all the modern amenities. We're already looking forward to our next visit. If you stay 6 nights, the 7th night is FREE! Contact us directly to receive this special. PETS STAY FREE!